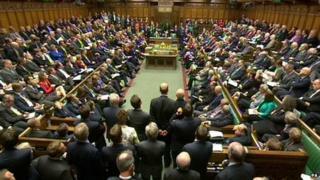 The government's motion proposing air strikes was carried by 524 votes to 43 after being backed by the Labour opposition. The motion was opposed by six Conservatives, one Liberal Democrat, and 23 Labour MPs, with Rushanara Ali abstaining by voting for and against. She resigned from the opposition front bench in order to abstain. UNSC Resolution 2178: How easily can it be enforced?